I am a proud member of the Guidecraft Educator’s Blog Team and have had the opportunity to try out some amazing products to introduce to Simply Stacie readers. Just when I think that Guidecraft cannot possibly top their current product line, a new toy is released that is simply exceptional! TEXO™ (100 piece set is $39.99) is a wonderful, unique learning toy from Guidcraft that was designed to encourage young builders’ to use their imaginations to create a wide range of designs such as bridges, houses, rockets and so much more. TEXO™ has far exceeded my expectations in terms of its learning value and entertainment factor. In fact, my three children who are ages 8, 6 and 5 leaped up and down with excitement when they discovered this toy…….two hours later my sons and my daughter were still playing and they ask to play with it every single day! TEXO™ was designed to help children develop an understanding of the basics of architectural foundations including form and function by creating a toy to scale and through hands on play. My eight year old son is especially passionate about building and has declared that he would like to be an engineer when he grows up because creating his designs and see it work is “amazing”. He really enjoys designing his creations and if a particular design doesn’t work he will study it to see what went wrong and try to rebuild it again. When he succeeds he is always beaming with pride. My two younger children really like to play with the toy in a simpler way but are still learning valuable skills by stacking, sorting, sequencing and ultimately showing off their designs too. This toy is unlike any other building toy my children have played with as it features a variety of interconnecting pieces for infinite building possibilities. The vibrant colors of the geometric shapes, solid wood rods and planks and molded plastic connectors are visually appealing to children who will immediately start connecting their structure together. The pieces are designed to be durable for long lasting play. The detailed instructional activity guide is very helpful as my older son can read the directions aloud and my younger children can follow along with the guided photos. 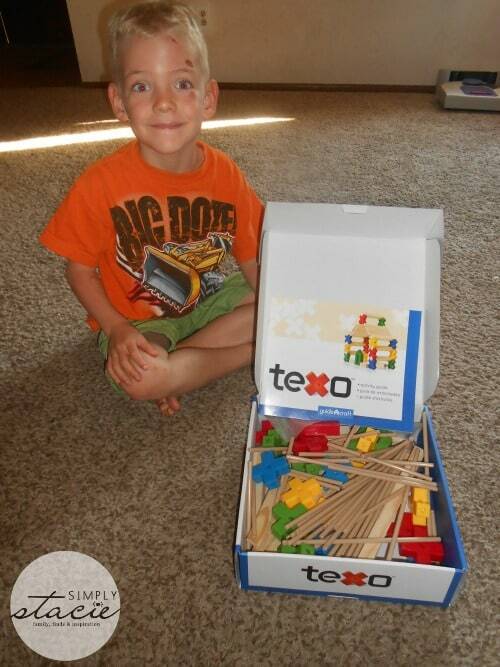 With the holidays approaching soon, TEXO™ would be an excellent toy idea for children. 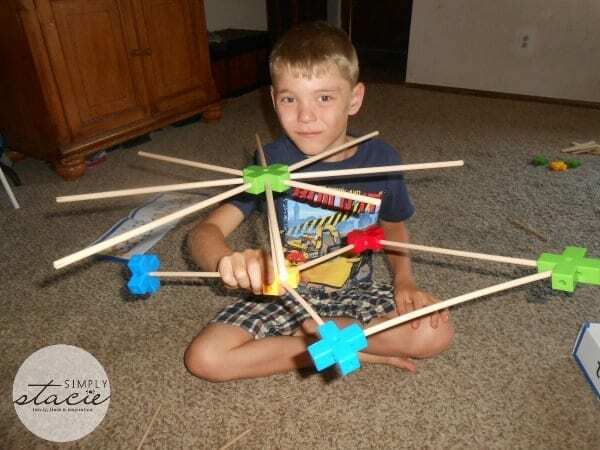 It is sure to inspire tons of creative play and I love that it promotes play without the need for batteries or electronic gizmos……good old fashioned fun playtime! You are invited to visit Guidecraft to browse all of the sets in the TEXO™ toy line ranging in price from $24.95-$79.95! Love the idea of TEXO™ as much as I do? Head on over to our fellow Guidecraft Educator blog team member’s page and enter the giveaway to win a 100 Piece TEXO™ set at Pre-K Pages! Reminds me off Tinker Toys. Looks like a great product, will check it out as a possible Christmas present. 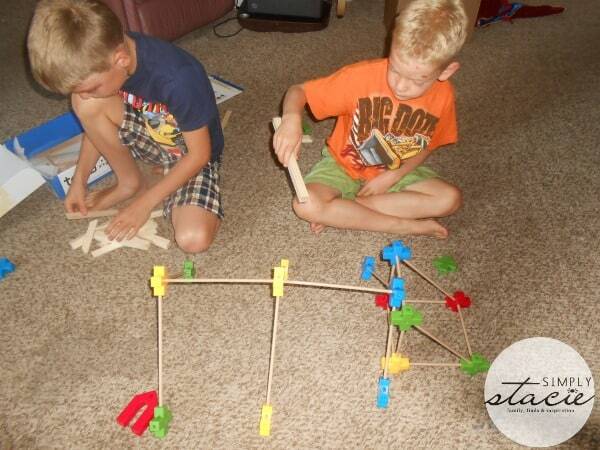 Love toys that encourage kids to be creative! looks like lots of fun! 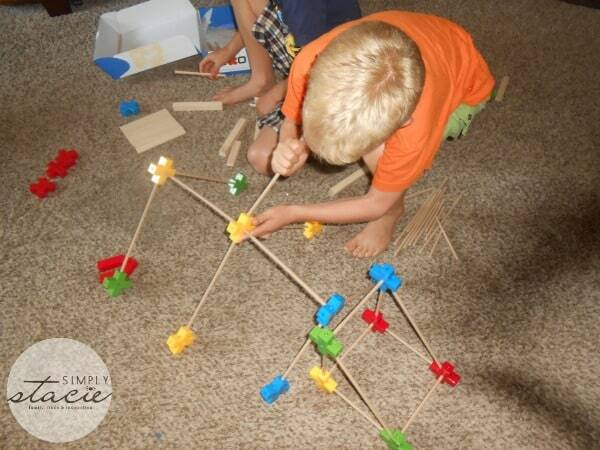 great for fine motor skill development as well. endless options for building! It looks really fun. My grandson loves making contraptions and buildings out of cereal and toy boxes and paper towel rolls. I know he would have a blast with this. Two hours! That right there is a selling point. Good luck to your aspiring engineer! This looks like a great toy for my son who really enjoys building stuff. I remember tinker toys like someone else posted and this is very much like them. I think I could have fun with the kids using TEXO! Love this toy! I could see my son playing and building with this! Very cool. I found this set this week when we were out shopping and after reading your review I picked one up for a Christmas present, hopefully my friends little boy will like it.